The empire rests on the edge of a knife, and sisters Ashyn and Moria are the handle and the blade. Desperate to outmaneuver the evil Alvar Kitsune, whose hold on the people grows stronger every day, Emperor Tatsu begs Moria to put aside past grievances and ally with Gavril—at least long enough to make an attempt on Alvar’s life. Meanwhile, reunited with her long-lost grandfather, Ashyn discovers that she is the key to a ritual that could reawaken an ancient dragon and turn the tide of the coming battle in their favor. And here it is! The concluding book to Kelley Armstrong's Age of Legends series and I couldn't have asked for anything better. Ever since finishing the second book Empire of Night I had been anticipating the release of Forest of Ruin. So naturally when it did come out I did my ever best to find this book so that I could read it as soon as possible. Unfortunately traipsing around my local stores brought no luck so I did have to order it online and then wait for its delivery but I soon did have it in my hands and a buddy read ready to go with a friend that I had read the whole series with. So in Forest of Ruin we did pick up where we left off and I won't say anything more than that for fear of spoilers but my, my, my, was I kept on the edge of my seat throughout the whole of this book? There were twists, turns, events that I would have never thought would have happened and they happened and I was left breathless, in tears, caught in a whirlwind of emotions from betrayal to euphoria to utter devastation. There were plot twists and aspects of legends and stories added to this novel that made it the ever more action packed than it was previous. There were epic battles and times where your heart was in your mouth for fear of characters survival and it was all such a rush. This concluding novel was everything that I was looking for and more. I am disappointed that the story has come to an end but that was inevitable and I am completely happy with how everything wrapped up in the end. So if you did enjoy the previous two books or even the first novel and haven't yet continued with the series, the question you must ask yourself is why the hell not? 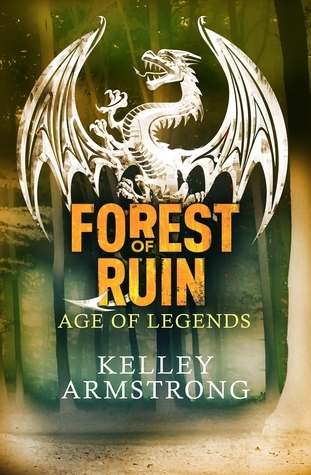 And if you haven't picked up or touched this series yet you should really consider it as you will not regret it especially if you are already a Kelley Armstrong fan or if you are a fan of the dark and gory type of stories, of the stories that you can't predict or that will keep you on the edges of your seats. This is the series for you. I honestly can not wait to see what else Kelley Armstrong has in store for her new releases especially for her YA audience because I for one will be sure to pick them up. 1 Star - Hated / Did Not Like One Bit - Did not like at all, not the book for me, I may have finished it but was forcing myself to read it. 3 Stars - Alright - This book was alright, nothing fully irked me, if it is in a series I might read the rest. 4 Stars - Enjoyed - Really enjoyed, the story was very enjoyable and I enjoyed reading it. 5 Stars - Amazing - Definite read, unputdownable, 5 stars, enough said. Mid-Year Book Freak Out Tag!! Sarah has read 7 books toward her goal of 65 books. Watermark theme. Theme images by Barcin. Powered by Blogger.